Getting to see Lizzy Borden after all this time was like a dream come true. I was literally overjoyed. Having the chance to ask him a few questions prior to the show was an extra bonus I’d dared not even hope for. I didn’t want to take up too much of his time as he was preparing for his set, nonetheless, Lizzy Borden himself was very gracious about conducting the following interview…. (My sincere thanks to Steph Perry, Steffi Scott and of course, Lizzy Borden for this wonderful opportunity)! Lisa – How is the tour going so far? Lizzy Borden – It’s fun. We’re having a blast. We haven’t stopped for a second since we left. This tour happens to be exhausting because it just keeps going. I mean, we had a night off last night, but it was a meet-and-greet in Akron (Ohio), so it wasn’t really a night off, except that we didn’t play. But we are having so much fun. L – Was the meet-and-greet what you hoped it would be last night? LB – Yeah. Ripper’s place is really nice. They treated us great, we had a great time. We hung with him for awhile and we had a blast. L – Did you have a hard time for the set list on this tour?After all the albums you have put out over the years, did you have trouble deciding what to play this time around? LB – Well, when we did the Master of Disguise tour, we did like 90% of the album and like maybe two old songs. When we put out Appointment with Death, we did seven new songs and then whatever time was left, we did some old songs. But with this one, I knew it was going to be a ‘best of’ collage. So I was fine with squishing as many songs as we could into the set, that I like and that I hope the fans like. I know we have fragmented fans. Some like the early couple of records, some like the middle records, and some just like the new record. So, it’s fragmented, I can’t make everybody happy and I already know that. I just try and do the best I can with putting the best show together. L – When I was talking with Rob Cavestany of Death Angel awhile back, we discussed how their song “Bored” is the ultimate classic for them; the one that drives their fans wild when played live. So, it naturally surprised me when they didn’t play it on that tour. I always figured it was a given. Basically, what I’m getting at is: Can we expect to hear “Me Against the World” tonight? That’s pretty much your “Bored”, I would think. LB – I don’t think I could go on stage without playing it. It’s my battle cry. So, we continue to play it. There’s another song that surprised me and that’s “Eyes of a Stranger.” It became a big hit in Europe and over here. L – I like that one a lot too. LB – Yeah, it blew my mind, because I just threw it in there last summer in Europe and it was amazing. So, certain songs surprise me, that I didn’t know would have that reaction. L – Certain songs affect people different ways. I know for me, one of my absolute favorite songs of yours is “One False Move.” I just love it. It literally gives me chills. LB – Great. Thank you. L – After all these years, what is the main motivational drive that keeps you going? L – So, tell a little about the two newer members, Dario Lorina and A.C.Alexander. I know you, Joey (Scott) and Marten (Andersson) already, but I’m not so familiar yet with them. LB – Dario Lorina is a guitarist from Las Vegas and he’s just an amazing player. He came into the band a couple years ago. His first show with us was a festival in Germany, so we broke him in good. And it was a long show..like an hour and a half show. L – Was it Wacken? LB – No. We headlined it…but I can’t remember the name. (Laughs) It was a smaller festival. There was only like 5,000 people. But it was fun as hell. Lorina has been amazing; a perfect fit musically, personality, everything. Then A.C., we just got him. He went on tour with us all last winter in Europe, and now this tour. So, this is his third run with us. He’s perfect. He’s the shot in the arm that we wanted. You’ll see him on stage. He’s just adrenaline. L – Besides music, what else do you like to do in your spare time? LB – Well, lately, all I’ve been doing is Lizzy Borden. I’ve been constantly working with agents and different things are happening. L – How do you feel you have evolved over the years personally? LB – Well, I can appreciate and enjoy things more now. For instance, when we go through Europe, it’s just so fun for us, the way we do it. We hook up with all the locals and everything. It’s something that no tourist could ever experience, the way we do it. It’s kind of like a gypsy train coming through. So I enjoy that whole part of it. That’s something I would not have done, and I didn’t early on. L – Are you currently working on any new material? Any other projects in the works? LB – Yeah, we’ve been working on stuff. We’re doing this album a different way this time. Dario and I spent a week in a hotel in Sweden just writing away and we wrote one of the best songs I ever wrote. That will probably be the third or fourth single because it’s so different than anything we’ve ever done. But I love it. I want to get it out, but it’s not right for a first single. But we’ll have something out..maybe in October possibly. I just got asked to be in a movie and it’s a pretty cool movie. If they get all the people they’re looking for, for at least this one particular scene, it’s going to be a pretty cool rock movie. We’re going back to Europe for the winter tour, we’ll probably go back to Japan and maybe do another run through the States when we come back. This tour came off so abruptly. It was just thought up a few months ago. We were like “Let’s do it.” They booked it and made it happen, but it was a quick thing. But when we do it again, it will be a package and it will be way better. L – So this won’t be your last tour then, thank goodness. L – What do you do to take care of your voice? LB – The best thing I ever did was get ’in-ears.’ Because now I don’t have to scream over loud guitars, I can just hear my voice perfectly. L – I was curious about your video for “Under Your Skin” and your message about ‘cutting.’ Is that something that hits close to home for you? LB – I did know some people and wrote the song based on that. Then we brought in the director and she actually had a personal friend who was involved in that. So then we had all these people who were involved in that and it hit home. It was just something I picked up on because I kept seeing it around. L – I guess that is all I have for right now. Do you have any closing comments? LB – Yeah. I hope that the fans keep tabs on what we’re doing. It’s really about the Facebook and about Lizzy Borden.COM and everything. If we get the kind of reaction that we’ve been getting on this tour, then of course, we’ll do another one. That’s what we’re kind of building on. Thank you. 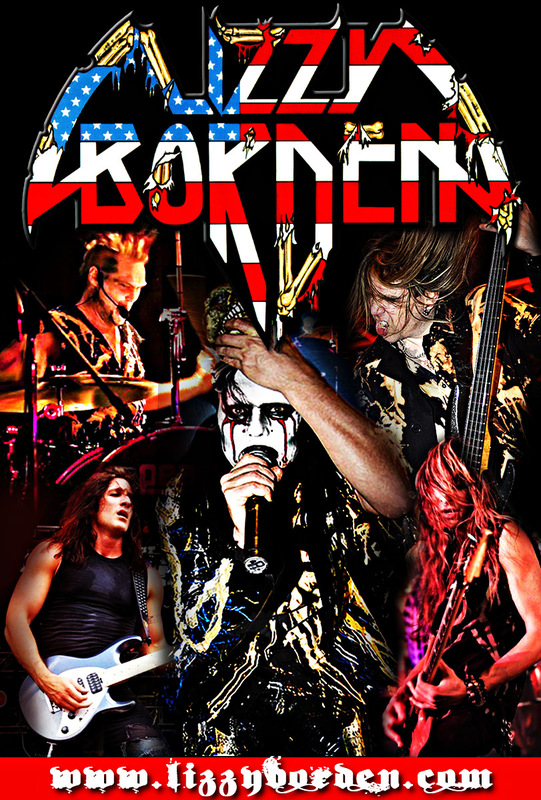 Take a chance and check out Lizzy Borden live. You will not be disappointed. This is a show well worth seeing and a band well worth supporting. Like I said, I have been a fan since 1987, and I know I’m not the only one. Loyal fans are the result of a dedicated and genuine band who knows how to project total heart and soul into their music. Lizzy Borden has always been a fine example of that. Check out www.lizzyborden.com and be sure you don’t miss out on them when they come to your area. This was a great honor for me. Thanks again, Steph!